Background: Obesity is a global health problem, increasing susceptibility to Type 2 Diabetes (T2DM) and Cardiovascular Disease (CVD). Varieties of products have been proposed for treatment with varying degrees of success. Recent studies, suggested Oligonol; an optimized phenolic product mixture from Lychee Fruit Polyphenols (LFP); as such treatment in Japanese population. Objectives: We aimed to investigate the effect of oligonol on weight, insulin resistance by (HOMAIR), lipids profile, leptin, Adiponectin, and resistin in healthy overweight and obese Saudi females. 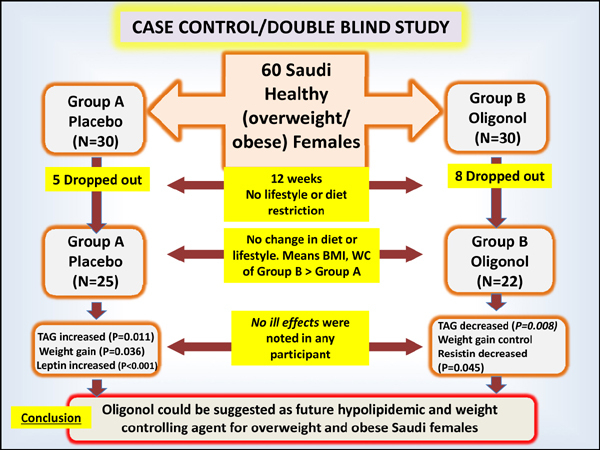 Subjects and Methods: 60 Saudi healthy overweight and obese females were enrolled in a double blind case/control study to take either Oligonol or placebo for 12 weeks without dietary or lifestyle restrictions. Weight, height, Waist Circumference (WC), hip circumference (HC), and blood pressure were measured, and fasting blood samples of participants were taken before, and at the end of study. Total cholesterol, HDL-cholesterol, triglycerides, glucose, insulin, leptin, adiponectin, and resistin were measured. LDL- cholesterol, HOMA-IR were calculated by equation. Results: 47 subjects completed the study, 25 in placebo group, and 22 in Oligonol group. No ill effects were noted in any participant. Oligonol reduced means of serum triglycerides (P=0.008), and resistin (P=0.045) significantly. In addition, no weight gain was noted in oligonol group, unlike placebo group which exhibited significant increase in mean weight (P= 0.036), WC (P=0.027), HC (P= 0.047), and leptin (P <0.001). Conclusion: Oligonol could be suggested as future hypolipidemic and weight controlling agent for overweight and obese Saudi females. Keywords: Abdominal obesity, adiponectin, insulin resistance, leptin, lipid profile, oligonol, resistin. Keywords:Abdominal obesity, adiponectin, insulin resistance, leptin, lipid profile, oligonol, resistin. Abstract:Background: Obesity is a global health problem, increasing susceptibility to Type 2 Diabetes (T2DM) and Cardiovascular Disease (CVD). Varieties of products have been proposed for treatment with varying degrees of success. Recent studies, suggested Oligonol; an optimized phenolic product mixture from Lychee Fruit Polyphenols (LFP); as such treatment in Japanese population.